About the only good thing to come out of a recent trip to Ohio (since I was as sick as a dog for most of it) was that I picked up 10 12-pack cartoons of Big Red Soda to bring back to my home in Southeastern Pennsylvania. Big Red ® has become the dominant player in the “red” category. For the unfamiliar, the taste is described as similar to a cream soda but also as a fruity, vanilla taste, similar to bubble gum. 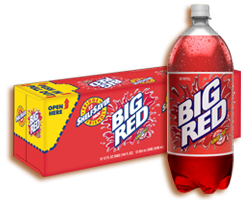 The fact is there is nothing to describe the unique delicious taste of Big Red ®. It just tastes “red” and if you haven’t tried it, you’re missing out on a real treat. If you live nearby and would like a taste, let me know. For those of you who already live where you can get this soda in any store or market nearby, I envy you. Posted on April 15, 2006 December 5, 2014 by WPosted in Silly StuffTagged Big Red soda.